In a Nutshell: Winding Tree is a nonprofit working to bring innovation to the travel industry through open-source and blockchain technology. The industry is currently dominated by a handful of intermediaries connecting service providers and consumers. We spoke to Winding Tree CEO Maksim Izmaylov about how blockchain can help lower barriers to entry for travel industry newcomers. He also discussed the philosophy behind the company’s nonprofit status and how its LIF token will be used to help govern the platform. Planning and booking trips has never been easier thanks to the internet and the broad access it gives travelers to price options for hotels and airlines. But the folks at Winding Tree will tell you that, while booking travel online may seem convenient, the travel industry has evolved into a nearly monopolized ecosystem that does not have the customer’s best interest at heart. “In the U.S., 92% of all hotel bookings go through Priceline or Expedia and the vast majority of flights are booked through a handful of global distribution systems,” said Maksim Izmaylov, CEO of Winding Tree. Winding Tree is a nonprofit that is implementing blockchain technology and open-source protocols to introduce innovation into the travel industry. This will enable more connections between consumers and suppliers and return power to hotels and airlines. In the end, Winding Tree’s approach could help bring new and innovative ideas to the travel industry, bring lower prices to consumers, and higher profits to service providers and suppliers. We recently had the chance to speak with Izmaylov about how his company plans to take on the travel industry, from Winding Tree’s technology-forward approach to restructuring the industry hierarchy. Izmaylov has experience being an outsider in the travel industry. He said it’s very hard for newcomers to break into the industry — an insular world that is not open to new ideas. He eventually succeeded with his previous startup, Roomstorm, but not without great effort. With Winding Tree, Izmaylov said his goal is to foster innovation and new ideas in the travel industry by promoting open-source technology and open collaboration. 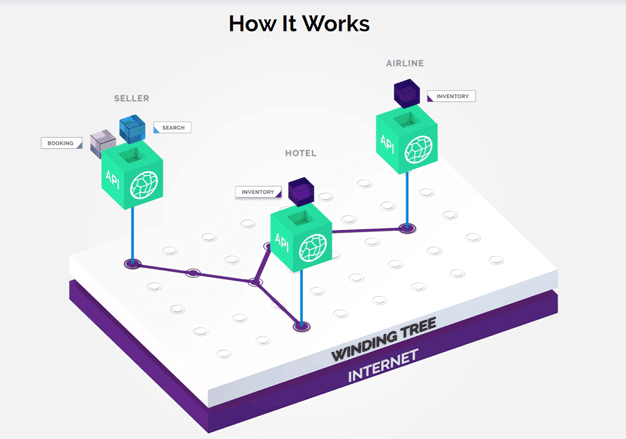 Winding Tree’s platform facilitates direct communication between consumers, hotels, airlines, and other service providers. He said by promoting new technology, Winding Tree can help lower barriers to entry and give new voices and ideas a chance to be heard in the travel industry. “Completely new people will do things we haven’t imagined in the space,” he said. Winding Tree achieves its mission through the use of blockchain technology, which Izmaylov said is just one means to help change the structure within the industry. With the current industry organization, the companies that sit between consumers and hotels or airlines are taking up to 25% commission fees. Additionally, Izmaylov said the online travel agencies and global distribution system leaders force hotels and airlines to offer the same prices as they do, so the consumer has no motivation to go directly to the service providers for booking. “Blockchains are fundamentally designed to remove intermediaries from many areas of human life and by doing so solve problems (like inequality) that exist only because of centralization of power,” Izmaylov wrote on his website. By applying blockchain to the travel industry, hotels and airlines can cut out the intermediaries, such as Priceline and Expedia, and reach the consumer directly. He said the strategy is even detailed in many venture capitalist fund manifestos. But, monopolies are fundamentally bad, Izmaylov said, because a monopolized industry leads to a situation where the company is not building a product or service designed for people to actually use but rather to make the stakeholders money. Rather than strive for the highest profit, Winding Tree is a nonprofit whose goal is to spread innovation to the travel booking industry. He said some people may think he’s crazy or call him a communist, but Winding Tree’s goal is not to make a profit — it is to enable innovation in the travel industry through collaborative projects. The nonprofit funded its initial phase in 2018 via ICO (more about Winding Tree’s LIF coin below) in which it raised 16,278 ETH and went from 736 backers to 13,860 backers. Additionally, Winding Tree plans to continue to generate funding through consulting services and the development of proprietary software products for travel companies, with the focus on projects built on top of the Winding Tree platform. Winding Tree’s 2018 ICO generated nearly 25 million LIF tokens. While the initial idea behind LIF was that it would be used for payments, Izmaylov said the use cases for the token have expanded in recent months. He said that, as a form of payment, LIF does not offer any advantages over Bitcoin or Ethereum. Additionally, only a few airlines or hotels accept cryptocurrency as payment because of its volatility. But Winding Tree will be using LIF for token-curated registries, a concept that’s been widely discussed recently in the cryptocurrency community. The LIF token is the most important underlying technology of the Winding Tree platform, according to the website. Izmaylov provided a hypothetical scenario to illustrate the use case. To solve this problem and ensure travelers that an entity is legitimate, the person must use the LIF token to join the registry. And the person must maintain a certain LIF balance on the registry to prove his or her company is a legitimate player and not a scam. Winding Tree’s technology is open and available for anyone to use, Izmaylov said. The more voices working to innovate and improve the industry the better.